The High Sierra Regatta will take place again on Huntington Lake after a two-year hiatus. 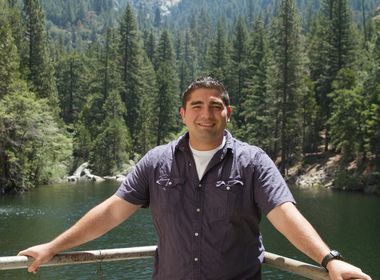 The sailboat races will be held July 9-10 and July 16-17 at SCE’s Huntington Lake reservoir. Members of the Fresno Yacht Club have been a forlorn lot of late. 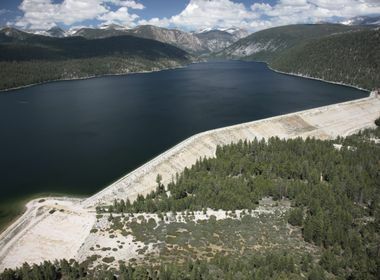 The High Sierra Regatta, the high point of the 57-year-old club’s racing season, was canceled for the last two years because of the drought and low water levels at the Huntington Lake reservoir where they compete. But this year the weather gods smiled on the region. Snow and rain in the Sierra Nevada Mountains east of Fresno provided enough runoff to fill the lake, part of Southern California Edison’s Big Creek Hydroelectric Project. SCE manages the water levels in the lake. Andy McMillan, an SCE manager of the Big Creek hydro system, said the weather was a mixed blessing. Precipitation this year came in at 106 percent of normal, but more of it came as rain, which simply ran off early or was absorbed into the ground to replenish aquifers. The snow pack was better than the past few years — 80 percent of normal — but the weather was warm early in the season so it began melting earlier than usual. 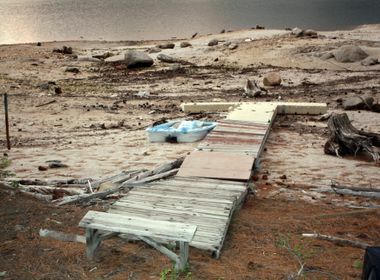 McMillan told the yacht club in April there was enough precipitation this year to keep the lake at normal levels through the summer recreation season. After Labor Day, the water will be drawn down so it can be passed along to farmers in the San Joaquin Valley. Bob Comstock, a former member of the U.S. Olympic sailing team and chairman of the High Sierra Regatta, said yacht club members are excited about competing again on Huntington Lake. “A lot of us kept our boats sitting by the house the last two years,” he said. Two years without racing also cut into the club’s ranks. They lost about a third of their members. This year, they expect about 150 competitors with a crowd of 600 attending July 9-10. On July 16-17, they anticipate about 100 competitors and a similar crowd. Comstock said sailors from New Zealand will be coming with Moth Class sailboats. The one-man sailboats, which are only 11 feet long, skim the water at high speeds. Nine Moth class boats will compete during the regatta. Comstock said the best news of all is that there will be sailing on Huntington Lake throughout the summer. Unlike some of the lakes at lower elevations, Huntington Lake gets good winds all day long. “It’s the perfect lake for sailing,” he said.